Bad Weasel Games has been a busy place since we released Big Bad Sudoku Book v2.0. 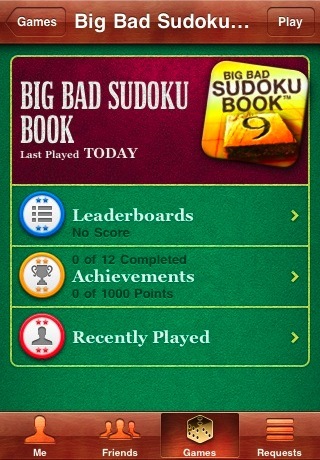 Sudoku Book 2.0 added support for all iOS devices in one universal app, high resolution graphics for the Retina display on the iPhone 4 and new iPod Touch, and many more new features. We’ve been hard at work on two new games. But first we are prepping a new update that supports Apple’s new Game Center and also fixes a few of the minor issues with 2.0. The new version allows players to use Game Center features (only on the iPhone and iPod Touch) to see how they compare with their friends via a Leaderboard, and introduces Achievements. Of course, all the version 2.0 social gaming features are still there. You can still sends puzzle to friends for competitive play over facebook, email, or even via a text message (if both devices support text messaging). When you update to version 2.1 all your previous progress will be saved and apply towards your achievements. Campaign Mode puzzled played across multiple load sessions now correctly unlock the next puzzle. The timer no longer sticks. Auto import of puzzles from Facebook friends – now ignores puzzles that had previously been imported. If you want to import a puzzle a second time just use the facebook app to find it and click on the link. Improved the readability of some of the numbers in the status font. Added a Help button to take you to the help section on our website. The update is live NOW! If you have any questions or comments please Email Support.